In this classic work of spiritual guidance, the founder of the Rochester Zen Center presents a comprehensive overview of Zen Buddhism. 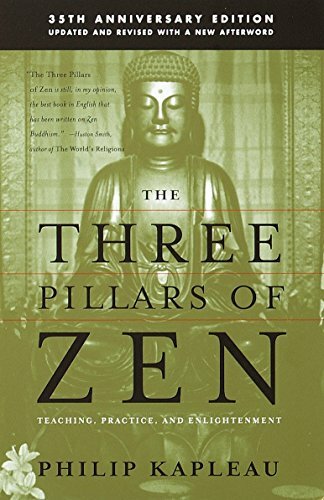 Exploring the three pillars of Zen—teaching, practice, and enlightenment—Roshi Philip Kapleau, the man who founded one of the oldest and most influential Zen centers in the United States, presents a personal account of his own experiences as a student and teacher, and in so doing gives readers invaluable advice on how to develop their own practices. Revised and updated, this 35th anniversary edition features new illustrations and photographs, as well as a new afterword by Sensei Bodhin Kjolhede, who succeeded Kapleau as spiritual director of the Rochester Zen Center. A moving, eye-opening work, The Three Pillars of Zen is the definitive introduction to the history and discipline of Zen. Through his exploration of the three pillars of Zen -- teaching, practice, and enlightenment -- Roshi Kapleau presents a comprehensive overview of this ancient oriental discipline, making it useful to both initiates and long-time disciples.